The most important thing in this recipe is the dough. You need to have precision with the initial rolling out of the dough and butter. Chilling the pastry between each subsequent roll and fold allows the butter to harden so you can build up clean, even layers of dough and butter. This Puff Pastry is adapted from Paul Hollywood’s Cheats Puff Pastry. Here’s the quick and easy recipe for your Christmas party. After bringing the dough out of the refrigerator roll into a rectangle. (Cut the uneven sides with a knife). Now cut the rectangle into six or eight squares with a knife. 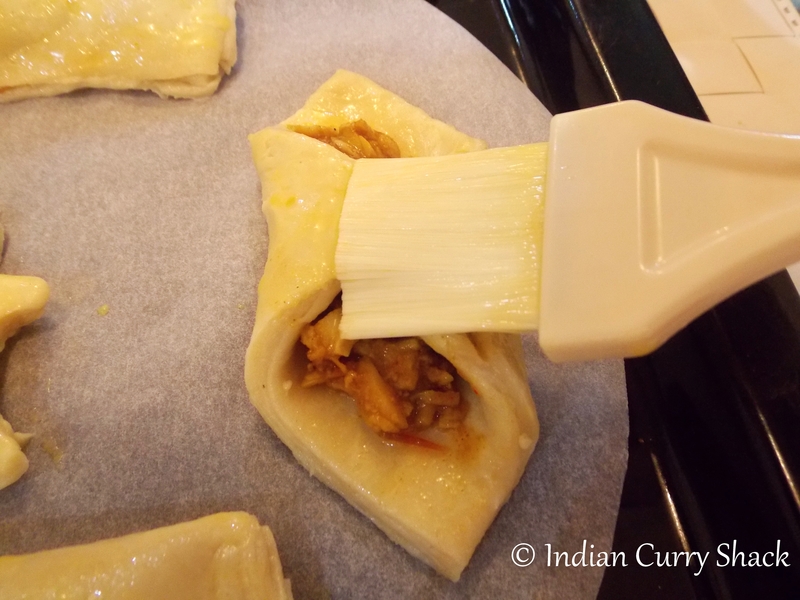 You can put a filling of your choice (like I have added curry chicken threads in the photo below) and join two of the four corners (you can experiment with any shape you like). Pre-heat the oven at 180 degree celsius. Put baking/parchment paper in a baking tray and then put all the pastries on it. Brush all the pastries with egg on top. Now bake them for 13-15 minutes or until golden and puffy. What can be used in place of egg? You can brush the pastries with cooking oil instead of egg before putting them in the oven.